Enchanted Excurse: Do You Have Sweet Venom? Do You Have Sweet Venom? Afternoon Loverlies! I have finally read one of the books in the mythology challenge I decided to do this year. 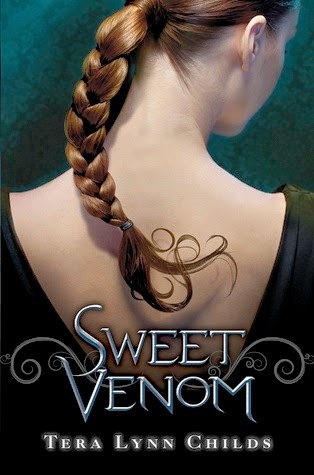 It is called Sweet Venom written by Tera Lynn Childs. I thought this book was easy to read and an interesting take on the Medusa myth. I always found Medusa's story to be an interesting. I don't know but snake hair and the power she has, just seems interesting. It makes me think of her as beautiful in a way. I am going to have to find the other books at the library, to find out what happens. There was one part that left me guessing, there are these boys in the story that like each girl. They are almost to the point of stalking them kind of. The writer didn't really explain about them, I'm hoping they are explained in the second book. :) I am assuming that they have powers also. We shall see!! This sounds pretty good I love the cover and mythology is so fascinating! I've loved books with mythology since I read the Percy Jackson series. For some reason I thought this was book 1! 'll have to keep an eye out for this one! Great review, Robin!